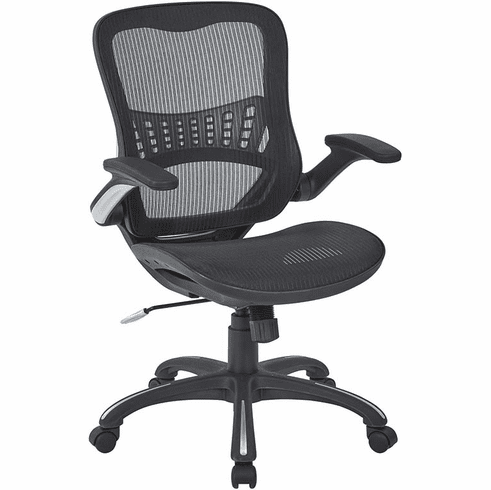 This Work Smart™ Mesh Manager’s Chair in Black combines durable, sturdy aesthetic with ultimate comfort. The framehas been sharply designed in nylon and braces a mesh screen back that delicately cradles the curves of your spine with built-in lumbar support. You'll have full control over your chair The accommodating range of 2-1 synchro locking tilt control with adjustable tilt tension lets you have full control over your chair. Designed with up-to-the-minute technology this chair is a sleek home or office addition accomplished with style and professionalism. Seat Height Min: 17.25" - 20.5"